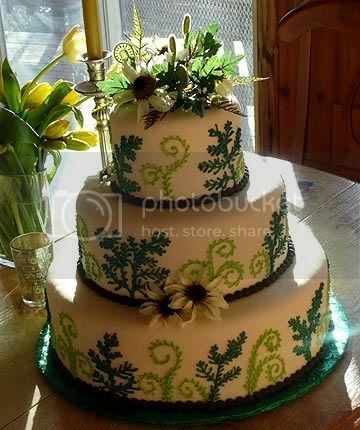 Above: One of Trish Gordon’s cakes adorned with ferns. Trish’s Cakes is opening as the Sugar Pine Bake Shop. Big Bear’s new bakery, the Sugar Pine Bake Shop will open Friday, October 9, 2009 with a Ribbon Cutting Ceremony in the former Frank’s Bakery (aka Monk’s Bakery) building at 40191 Big Bear Boulevard, west of the Village. The Sugar Pine Bake Shop will be open for retail customers Friday and Saturday from 8 a.m. to 6 p.m. and Sunday from 8 a.m. to 2:30 p.m. Custom orders may be placed at any time. Owner and pastry chef Trish Gordon will also keep cake studio hours on Wednesdays and Thursdays from 8 a.m. to 4 p.m. during which the public is invited to drop by to watch as she decorates cakes. Trish and Jim Gordon are the former owners of the Gold Mountain Manor Bed and Breakfast in Big Bear City and an inn and restaurant in Vermont. Upon returning to Big Bear Lake three years ago, Gordon started a successful custom cake business called Trish’s Cakes. “The bake shop offers a way to combine all the things I love making little sweet treats to brighten someone’s day, artisan breads that satisfy the soul, and grander confections to commemorate a special occasion,” said Trish. Trish bakes all cakes from scratch using quality ingredients so plan on stopping by. I’ve seen a few of her cakes at different events and they are always stunning–and tasty! This entry was posted on Tuesday, October 6th, 2009 and is filed under Business & Commerce, Mountain Lake Resort.